← Healthy Weight Loss with Healthy Food: You Are What You Eat! on however, your reason for doing so will become an important factor in determining the way forward for you. But for now you want to know what next â€“ how do you go about starting to run. So letâ€™s get to it! For a beginner, the â€œhowâ€ question can be a very dangerous one as sometimes the answers you get, can put paid to your aspirations to go running. This is because in most cases, you will get so many different answers from so many people and these answers can be of such great length â€“ sometimes even contradictory! – that you become confused. In many cases the answers will be framed with such a rigidity and singularity of purpose, dedication and routine which it seems will be required of you as a runner, that you will wonder if running is not best suited for or left to robots, or you should become one yourself! You will begin to doubt your ability to carry through with a running routine as the discipline and sacrifices which are emphasized as being required of you to do so, will deprive you of a â€œnormalâ€ life. You will lose heart and not think you can do it. Let me not deceive you here. To become a runner will require some discipline and sacrifice. However, this will not be of an â€œexternalâ€ military style, but rather more in the nature of â€œself disciplineâ€. What you do is what you set yourself to do, that is, â€œwhatâ€ you do (your goals!) will be of your own making and under your own control and therefore within your own capabilities! Losing weight, becoming fit and slim, are often not easy, but it can be done by running â€“ and you can do it! Furthermore, after the initial â€œdiscomfortsâ€ (pain, soreness, stiffness, etc. ), you can actually begin to enjoy the process! can fill many volumes. For a new runner, if you begin to read these for guidance or listen to the often very vocal advice of some â€œseasonedâ€ runners, or some â€œin the knowâ€ about running, as to how best to do what you are about to undertake, you might begin to feel that you are going to be putting yourself in some of a straight jacket or undertaking some cruel and inhuman odyssey. So here I am not going to do that to you and instead, calm your fear. Asâ€the proof of the pudding is in its eatingâ€, I am going to help you to get a â€œrunning startâ€ (no pun intended! ), that is to start your running as quickly as possible, which is what you most want to do. I therefore will not list nor expound too much on those many and well tried â€œrunning proceduresâ€ which most runners usually adapt (believe me, in many cases these will become very natural to you later on in your running routines instead of your seemingly having to â€œdisciplineâ€ them within yourself!) or into which they are â€œfashionedâ€ and into which arena you will therefore make, as I see it, a more â€œnaturalâ€ entry. What you are about to be told about running to get fit and slim will therefore be more descriptive rather than prescriptive. However, at this time I must warn you that you will get a little surprise about this very shortly. As a beginner, having taken the important decision to run (important because you will be literally and figuratively running for your life! ), there are some important measures which you have to undertake or put in place and therefore of which you must be made aware before you start on your running venture. These are really for your own personal health and safety rather than being about a running routine itself. The longevity of your running efforts truly depend on these initial measures. They belong to what can be called the â€œprepâ€ stage for running. These however I will only briefly mention by way of a description, rather than fully dramatize or punch out here, as you really want to â€œget on with itâ€. The fact is that when you start to run, you will more easily appreciate and understand the validity and necessity of paying great attention to these factors. First, it is absolutely necessary before you start to run, that you consult your doctor about your intention to do so. This is essential at any age, but will be very much more so if you are olderâ€ and have not been indulging in much â€œphysicalâ€ activity. Many ignore this and soon come to much grief! You must get your general fitness and health condition assessed and be advised about the rate at which you can safely pursue your planned progress. Your doctor will know your medical record, e.g. past sicknesses, injuries, etc., and will be in the best position to direct you on what and how to best undertake in your running routines and thus counter or, at least limit, any negative impact on your body due to running. will not only determine the length of your running endeavors, but also the intensity which you bring to them. This motivation no one can give you â€“ you have to develop it for yourself. For some, the health benefits that will accrue from running are multitudinous and can serve as a motivator to keep going, especially so as you begin to experience these rewards for your efforts. The desire to lose weight, to become fit and slim, is for many a sufficient motivating factor. For others, it is a chance to be competitive, to become a marathoner, for example. Whatever is the motivating factor, you have to find your own. The motivation of others will not sustain your own running efforts. The subject of motivation, especially for â€œseasonedâ€ runners (yes â€“ even â€œseasonedâ€ runners need motivation!) is discussed at length elsewhere on this site, and will therefore not be further pursued here. Next, is the matter of your running shoes. This is where most runners get â€œshipwreckedâ€! Your shoes are literally and figuratively the â€œgroundworkâ€ for your running vocation and it is imperative from the beginning, that you invest in the proper pair for you, as this will assist in eliminating or at least limiting not only the potential short term damage or injuries which you can get from running, but long term ones as well. Remember that despite all its benefits, running does take its toll on your body. As mentioned earlier the â€œmechanicsâ€ of running, including that of footwear will not be developed or elaborated on at this stage, but will be explained in detail later. However, some important factors which you must take into account with respect to your footwear for running purposes, will be briefly mentioned here. You need a pair of shoes to help absorb the â€œshockâ€ your body and limbs experience when your feet hit the hard ground as you run and this is critical in avoiding many injuries with which runners can be plagued. The cushioning ability of your shoes is therefore a critical factor. The â€œgripâ€ of your shoes is also important. Your â€œstyleâ€ of running is also a critical factor. How your foot â€œrollsâ€ inwards or outwards (called over-pronation or under-pronation if it is more than normal!) is an important factor in the running equation. In addition you must take in consideration your running â€œenvironmentalâ€ factors such as what type of running (cross country, marathon, e.g. ), the kind of surface on which you are going to be running (asphalt, cement, dirt ,muddy tracks, trails, etc), hill running or flat surfaces and so on. You should also note that you must not use a very worn out pair of shoes, as this can cause injury. You should try to replace them after every 500 to 600 km. of use. It is therefore not just a matter of buying an expensive or â€œstylishâ€ designer pair, but rather getting the â€rightâ€ pair for you. Hence, if you are making a first purchase of this, it is advisable to seek professional help on these matters. Do not just â€œrunâ€ out and buy those which you see widely advertised, including brand names such as a Nike, Adidas, etc. As getting the correct pair of running shoes is perhaps the most important consideration in your decision to take up running, it is probably most advisable for you not to buy your first pair â€œonlineâ€ but to go to a specialist sports store or running shop. Such shops have highly trained people who have access to many modern â€œhigh-techâ€ equipment and paraphernalia to ensure that they are providing you with just the special quality of service geared for your special personal needs, rather than just selling you their most expensive pair of running shoes. Such professional staff are best able to assess and identify your particular running style and requirements and advise on the most suitable pair of shoes to fit accordingly. Getting â€œtipsâ€ of this kind is a must for all runners, no matter what level. Another thing to put in place before you start running is that of goal setting. Apart from the fact that this will give some â€œdirectionâ€ to your training routines, it sustains your motivation by way of achievement. Yes, you will want to know if you are progressing, if your fitness and health levels are indeed rising (are you losing those pounds and becoming fit and slim? ), and, if so, how fast. So you have to set some goals or targets over time. But be very careful here or you might just be taking on too much and, instead of you making steady progress, instead of becoming fit and healthy, problems develop â€“ and you are actually degrading your fitness and health! So your goals will have to be realistic and achievable. They must be set for your own standards, for the level of fitness and health you want to achieve, not for anybody elseâ€™s. level of fitness and health, running a 10 km race, finishing a marathon, etc., – might now be expansive and even have a level of wishful anticipation- your goals for the short term have to be real ones – ones that you can achieve. They cannot therefore be formulated on your own fancy or wishful thinking, but must be based on a careful consideration and assessment of your physical capability now and where you eventually want to be. Your short term goals are the small stepping stones to your overall future goal of health and wellbeing. You might even want at first to get a fitness trainer who can guide you on this and oversee your first running efforts. You will have to â€œdisciplineâ€ yourself and learn to write down these goals and carry out checks against them with respect to what you actually accomplish. Keeping a record of your runs will allow you to analyze how you have improved over the time period of training – how near you are to higher and special levels of fitness and health – and you will find it gives you pleasure as you see your improvements – you are becoming fit and healthy – slim and fit for some! If you set yourself realistic goals in the short term and the long term (the medium term goals will take care of themselves! ), it will help you keep motivated and will lead to success in your quest for fitness and health. Lastly, in this â€œprepâ€ stage, you will have to become more conscious about your food intake and the amount of rest you get. Again this will not be elaborated on here (they are discussed extensively else where on this site) as you want to “get with your running”. Without at this time giving reasons therefore, I ask that you note that proper dieting is essential for running. Once you start your running routines, you will have to begin to pay some special attention to this, as what you eat plays a significant and supportive role to your â€œphysicalâ€ exercises. Food replenishes the energy you use up in your running routines and you need this replenishment for your future runs. Again, without going into too much details about this here, please note that the best foods for runners to eat in terms of energy replenishment and store and of digestive ease, are what are commonly called â€œcarbsâ€, meaning foods with high carbohydrate content. These should be reinforced with foods of high protein content , e.g., white rice, pasta, bagels, low fiber fruits and vegetables and some dairy products. Foods with a high fiber level, high- fat levels foods should be avoided. Additionally, drinking a large amount of fluids, especially water is a must, the more so if you sweat profusely or live in very temperate climates. As noted earlier, adequate rest is essential as it is during this period that your body is able to renew itself and you get the benefits (muscle build up and strengthening, flexibility, increased endurance, etc.) of your running exercise. So now you have done all the â€œprepâ€ work and are â€œreadyâ€ to go out to the track â€“ and start your running at long last! Yes, you are going to get on the track alright â€“ but what if I tell you it is not to run â€“ that when you get out that first time on the track, that you are not going to run at all! Astonished? Disappointed? Disillusioned? Dumfounded? FRUSTRATED? Yes, most (and more!) if not all of these â€“but remember I said earlier that there was going to be a little ( little? â€“ its really a biggie!) surprise for you about all this? Well here it is. WE DONâ€™T RUN – WE WALK instead! with running, you walk before you run! There are excellent and compelling reasons for this, which, in keeping with our approach to this matter in this early stage, I will not elaborate on here. Suffice it to say that in defense of this position, that it is all about preserving your health and wellbeing, keeping you from perhaps serious harm, injury and damage to your body, and that this is the well practiced and proven method and approach for all beginners to running! So you begin to walk at first. But this is a different kind of walking. 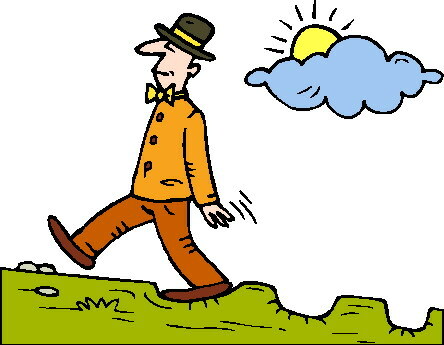 It is not the walking that you do to get you from point A to point B in your usual daily activities. This walking is about getting your heart beating faster and getting your pulse rate up. So you have to put more effort into it than you would normally do, you move your arms vigorously (they help to propel you forward!) and you look like you have a purpose â€“ for indeed you do have a purpose â€“ you want to start running â€“ and as you are not going to a meeting, you donâ€™t have to worry about arriving at your â€œdestinationâ€ all sweaty and out of breath â€“ and this will be the way of things for your first efforts at running â€“ or more appropriately â€“ walking! The secret about this is that you have to build up slowly. If you start out with great vigor and set yourself goals that are VERY far fetched, and if, as a result, you need to increase your energy level and range too rapidly, you will find yourself on a very fast road to serious physical damage and injury! You might even find yourself discouraged and your resolve wavering. How often it is that you see, when going at your â€œtortoiseâ€ or pedestrian pace, people racing by you, their arms swinging widely and almost uncontrollably, their gait very unsteady with their unusual pace, their chests heaving away and their panting and â€œasthmaticâ€ wheezing loud and clear, only for you to come upon them around the next corner, sitting on the ground or on the first bench they can find, gasping like a walrus for air, or standing unsteadily, arms akimbo â€“ utterly exhausted â€“ and SPENT! You donâ€™t want to do that, to undertake running at a level that causes you to end up that way. It is not sustainable â€“particularly as a beginner! Instead of getting fit and slim, you end up as a â€œmedical emergencyâ€! So you start off slowly with a â€œstrongâ€ walk â€“ meaning putting out a greater effort than normal. This serves the purpose of a â€œwarm upâ€ (the importance of which will be clarified later) as well as preparing your muscles and limbs for the greater â€œstressâ€ of running to come. After a while, you can introduce an easy jogging pace and alternate your running with this. You are able to â€œcatch your breathâ€ with these â€œwalking in betweenâ€ periods. When you start to do this and to what level and extent, no one can say exactly for you. Your body is the best diagnostic equipment. Listen to it. It will guide you best of all. intensity-wise. You will find yourself eventually doing more jogging and less walking â€“ and being comfortable, and not over stressing yourself. This way you will find that you are very easily able to increase your distance without too much â€œdistressâ€ and you preserve your energy for more efficient use and not waste it on useless energy sapping sprint forays. As the weeks go by, you will find yourself getting â€œfitterâ€ and â€œfitterâ€ â€“ less soreness and stiffness in your muscles and tendons, increased â€œenduranceâ€ (less huffing and puffing, decreased shortness of breath, stiffness around the chest, etc., etc.). There is danger here however, as with your new and sudden â€œfitnessâ€, you might want to advance too quickly and thus undertake too much too soon. Be cautious here and take great care not to get too carried away. You must also ensure that you do not run more than 3 or 4 times per week in this early stage. You donâ€™t want to be â€œoverdoingâ€ it here. This can cause early â€œburnoutâ€ and significantly increase the risk of injury to yourself! For a beginner, at this time you might consider an easy 2 to 2.5 miles jog. Try not to increase this too suddenly nor by too great an amount. The rule of thumb for such increases is a modest 10%. You might try to increase your intensity also, but many runners will cut back on their distances and intensity after say 4 or 5 weeks of application, reducing these by as much as 75% for a week. There is no â€œfixedâ€ rule about this â€“ only that you do not overdo it! You should ensure that you get the proper amount of rest and this means running, as suggested before, not more than 3 to 5 times a week until you build up your fitness and endurance levels to cope with this. the event – something you could never have contemplated before you launched yourself into your running routines to achieve fitness and health! It is worthwhile repeating that, especially at this early stage of your running career, you listen most carefully to your body. It will tell you exactly and quite clearly, how it is â€“ maybe not as fit and slim as you would like to be, but that you are definitely on the way to achieving this! Running is very hard on your body, putting great strain on your muscles, tendons and joints. By now, you will have gone through the early â€œrunningâ€ pains and be able to recognize what is â€œnormalâ€, especially after heavy training routines. Any sudden and intense pain, especially if persistent, should get your attention and concern. The usual approach is to stop running and get the possible injury looked at as soon as possible. On this website will be found extensive treatment of the usual running injuries. Instead of just running and more running, day after day, from week to week, do some alternative exercises. Replace one or two runs a week by alternative exercises. This is known as cross training, and can include, e.g. cycling, swimming, mountain hiking, dancing, even the odd dumb bell training, etc.! This reduces boredom, allows you to develop new skills and interests, and leads to better overall body and mental conditioning! Furthermore it reduces the chance of injury and gives those muscles which you utilize in running, some necessary recovery time! It will also maintain your motivation! To further help you along as a beginner who will not yet have experienced the benefits one gets from running, and therefore might want some encouragement or reasons in strengthening your resolve to take up running, you can use your running also as a stress reducing means. Stress results in several health problems including high blood pressure, heart diseases, strokes, impotence, depression, lethargy, stomach ulcers and indigestion- and the list goes on! See your running time therefore as a de-stressing drill. By doing this you are less likely to suffer heart related problems in your more advanced years, your fitness and health guaranteeing a life of better quality in your later years. You will also feel much more energetic and you will be improving the capabilities of your body to recover from common sicknesses and diseases â€“ and you will be much more productive at the work place! Good luck as a running beginner!